Out of the blue, Tesla has announced that it offered to acquire SolarCity for up to $2.8 billion in an attempt to create a one-stop shop for cleaner energy. Tesla said it offered $26.50 to $28.50 per share for SolarCity. The price is 25% to 35% premium to the solar company’s Tuesday close. If the deal goes through, SolarCity will adopt Tesla’s name and sell its solar panels alongside power-storing batteries. Officially, the Elon Musk reasoning is that suddenly you’ll be able to have your solar panels, car charger and battery storage all installed in one go. To this, we’re sure to hear serenades on the attractiveness of the energy storage business. A business that is already running massively behind expectations. Tesla shares plunged more than 13 percent to $189.99 in extended trading – amounting to a loss in value of about $4.3 billion, or more than the value of the offer for the other company. 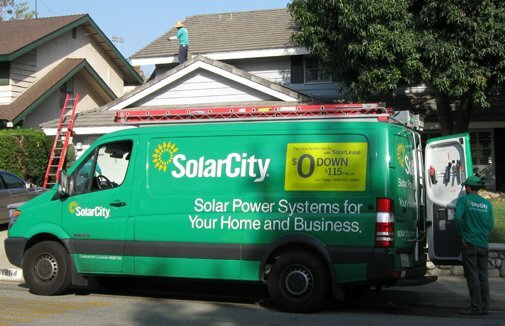 Shares of SolarCity rose about 18 percent to $25.02.